Of the six species of coral trees native to Madagascar, Erythrina perrieri is the rarest, known only from a single 100km² location of fragmented vegetation on Ankara Plateau. In 1973, seeds were collected from this species and grown in the collection at the National Tropical Botanic Garden in Hawaii. More than 20 years later, San Diego Zoo horticulturists traveled to the Botanic Garden on Kauai and collected leaf samples from E. perrieri, as well as from an unknown species of Madagascar coral tree growing in Koko Crater Botanic Garden on Oahu. DNA sequencing conducted in our Conservation Genetics lab showed that the unknown species at Koko Crater was also E. perrieri. Now, there are two known individuals of E. perrieri in the United States, which are being propagated at the San Diego Zoo via seeds and cuttings in order to establish additional collections. The DNA sequences generated for E. perrieri will be valuable future taxonomic and identification studies. San Diego Zoo Global works with our partners in Southern California, Hawaii, and Africa to conserve coral trees worldwide. This highly diverse genus contains 113 species of trees and shrubs that are used by animals for food and shelter, and by people for medicine, timber, and shade trees for crops. 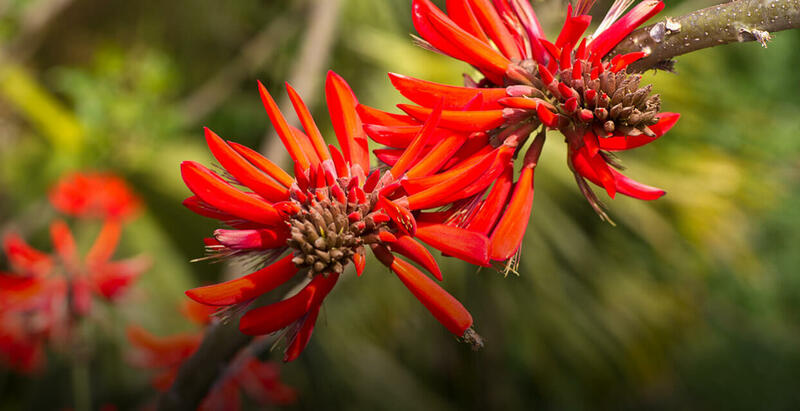 The San Diego Zoo has 51 types of coral trees on grounds, a dozen of which are highlighted for the public on a Botanical Tour map. This collection is accredited through the American Association of Museums and, as the largest coral tree collection in the continental United States, serves as an invaluable resource to educate people about this genus, including the critically endangered E. perrieri.